Rising sea levels caused by unchecked carbon emissions are threatening coastal regions around the world. A new series of paired images projects two very different future scenarios—one in which we manage to hit our carbon pollution targets, the other showing the dire consequences of staying on our current course. 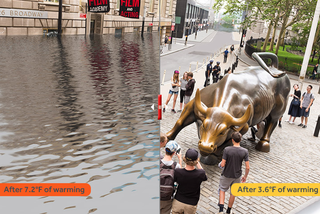 The following images—which shows the impacts of sea level rise on such cities as London, Shanghai, Mumbai, Sydney, Rio de Janeiro, Durban and New York—were compiled by Climate Central, along with the help of digital artist Nickolay Lamm, and were based on peer-reviewed research published last month at the Proceedings of the National Academy of Sciences. The first image of each pair (the one on the left) shows what might happen to various coastal landmarks if nothing is done to curb carbon emissions in the coming decades; this “business as usual” approach would likely instigate a 4°C (7.2°F) rise in temperature in the coming decades. According to the PNAS study, CO2 emissions leading to 4°C (7.2°F) warming could facilitate upwards of 22.6 to 35.4 feet (6.9 to 10.8 meters) of long-term global sea level rise. This level of sea rise has the potential to submerge land currently home to 470 to 760 million people on six continents in the coming centuries. The research also points out that aggressive CO2 cuts could decrease these threats by as much as half. Just a 2°C difference could prevent the submerging of land in China that’s currently home to 81 million people. Climate Central has also published a corresponding report and set of maps that take their new data into consideration. A new interactive tool called Mapping Choices allows you to explore the possible consequences of global warming for any coastal cities or postal code around the world.